When you're handling sharp objects, protecting not only your hands but also your forearms is integral to your safety. The Blade Runner 8001 Cut Resistant Dyneema Sleeve is an extremely comfortable sleeve that's made with Dyneema and glass fibre. 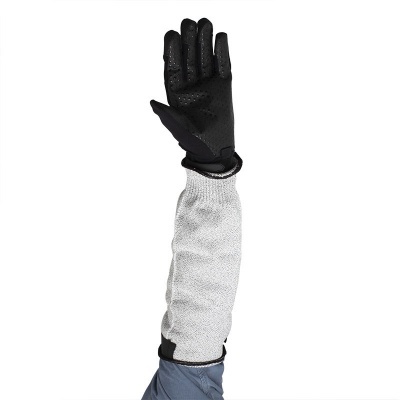 Paired with cut-resistant work gloves, the sleeve provides you with the ultimate protection. The 8001 Cut Resistant Sleeve is supplied in a single universal size that's comfortable for most users. As the sleeve is designed to be slightly baggy on the arm, this not only helps it fit a wider range of people but it also ensures it doesn't impede your movement. This Blade Runner Dyneema Covering is 35cm (14") in length. As a result, it suits most people. The sleeve has an adjustable Velcro strap for the upper arm and an elasticated-knit wrist, both of which help prevent the sleeve from slipping down your arm. Please note that although the Cut Resistant Dyneema Sleeve is pictured with a glove, only the sleeve is supplied.